For many centuries, those who would divine the future have assisted their clairvoyant abilities by crystal gazing, known technically as scrying. This method of divination is of such vast antiquity that it would be impossible to state exactly where it originated. It is known that both the ancient Egyptians and Babylonians scryed by means of gazing into low, open stone dishes filled with palm oil. But who can say for certain when the first diviner entered into an altered state of consciousness while gazing into a pool of water, a crystal globe, the surface of a polished gem, or any transparent object and received what he or she believed to be a vision of the future? 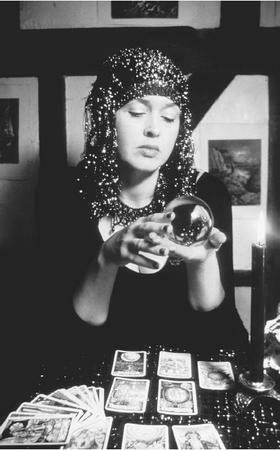 The practice of scrying consists of fixedly gazing into a crystal ball, often placed upon a black cloth in order to shut out all brilliant highlights and reflections. In place of a crystal ball, scryers will occasionally use the surface of a pool or a glass or saucer full of water, ink, oil, or other liquids. Such surfaces, when used by scryers for the purpose of divination, are known under the name of "speculum." In other instances, scryers will utilize a large piece of natural quartz crystal to serve as their window into other dimensions. In their instructions to those who would be scryers or crystal gazers, practitioners of the art advise the apprentice to make their mind a blank. They should gaze, rather than stare, steadily at the crystal, blinking as little as possible. It is also advised that they should not extend such steadfast gazes for more than five minutes at a time. If their eyes begin to water, this may be taken as an indication that their time limit has been reached. They should then end their experimentation without delay. miniature motion pictures, will develop, and certain scenes portraying the future or the past will be played out before their eyes. Such pictures and scenes—whether they are of familiar or strange locations—do not actually appear in the ball, crystal, or liquid; they are merely projected into the object by the subconscious mind of the scryers. If beginners are unable to see anything in the crystal or the liquid, the experienced practitioners remind them that they can attempt to train their latent ability. They suggest various exercises, such as strengthening their visual memory by first looking at a certain object in the room and then trying to project it, mentally, into the crystal. Neophytes might also close their eyes for a few minutes, thinking intensely of someone well known to them, and then trying with their eyes open to visualize a picture of that person in the crystal. Gibson, Walter B., and Litzka R. Gibson. The Complete Illustrated Book of the Psychic Sciences. Garden City, N.Y.: Doubleday and Co., 1966. Petrie, Jodra. Tell Fortunes and Predict the Future. New York: Award Books, 1968. Post, Eric G. Communicating with the Beyond. New York: Atlantic Publishing, 1946.